Chance is you find a lot of quick reference guide posters if you visit IT departments throughout the country. Techposters server two purposes. First they do provide the viewer (sometimes) with references that might be needed from time to time and then they are great for showing off. The second reason might not be obvious immediately but most users who come down to IT often are intimidated and in awe when they see posters like the anatomy of a Linux system, the Unix command line reference or the Microsoft .net Framework 2.0 quick reference guide. The techposters website is a collection of quick reference guide posters that have been collected from various sources on the Internet. All of the tech posters are available in pdf format. These posters can therefor be easily downloaded and printed on a local computer system. 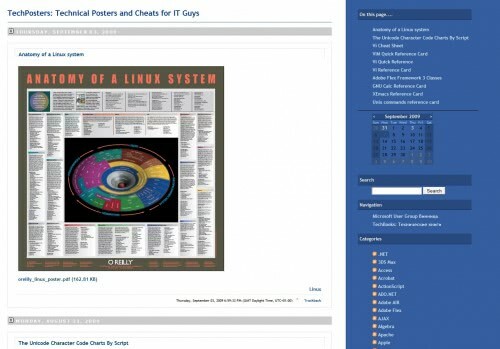 The majority of tech posters covers Unix, Linux and Microsoft operating systems but there are some additional reference guides that cover other software programs, platforms and scripts. The website is a bit hard to navigate and it is probably best to use the search or the categories to find the reference guides that are of interest. The website seems to be updated fairly regularly with new quick reference guide posters. Best way to keep track of new posts is to subscribe to the RSS feed that is offered. They help a lot with teaching yourself new things. Handy to have around. Great find, Martin. I looked all over that site and there is a ton of information there. Thanks! site seems down to me ? Was it too difficult to include the website address’ link (a.k.a. the URL) in your article?